AUSTINTOWN, Ohio –- No. 7 Mount Union has six wrestlers named to the All-Ohio Athletic Conference wrestling teams for the 2018-19 season. Highlighting the first team is sophomore Jordin James (Bedford) at 133 pounds, freshman David Massey (Cuyahoga Falls/Woodridge) at 141 and sophomore Antwon Pugh (Fairlawn/Copley) at 157. Representing the Purple Raiders on the second team is sophmore Luke Hernandez (Nashport/Tri-Valley) at 149 pounds, sophomore Michael McIntire (Wadsworth/St. Vincent-St. Mary) at 165 and senior Jairod James (Bedford) at 174. James, Massey and Pugh are all new appearances on the All-OAC First Team as they are also receiving their first conference honor. James currently holds a record of 30-1 as he went 5-0 in conference matches. The nationally ranked No. 1 sophomore also leads the team in technical falls with 13. In his debut season, Massey stands at 31-7 with an OAC record of 6-0. Massey defeated a pair of ranked opponents, one being No. 9 Austin Sherman from Muhlenberg to claim a first place finish at the Messiah Petrofes Invitational. Pugh remains undefeated at 26-0 with a pair of first place finished the Messiah Petrofes and at the Pete Willson Wheaton Invitational, while currently being ranked No. 6 in Division III. Pugh won four of his conference matches by pin-fall and the other by technical fall for a perfect 5-0 record. Also with first time honors is Hernandez. The sophomore captain recently joined the National Wrestling Coaches Association individual rankings at No. 10 after taking down No. 4 Stanley Bleich (Baldwin Wallace) and No. 2 Zachary Cooper (Alma) in consecutive matches for the 149-pound title at Pete Willson. With only one OAC loss, Hernandez's overall record stands at 26-8. With their second All-OAC selection are McIntire and James; both previously named to the first team for the 2017-18 season. McIntire competes in the 165 pound weight class with an overall record of 27-9. With 17 of McIntire's victories decided by pin-fall, he holds the second-highest amount of pins for the Raiders. James, the defending national champion at 174 pounds, stands at 29-4 on the season with only one loss coming from a Division III opponent. Earlier this season, James competed at the 56th Annual Ken Kraft Midlands Championships at Northwestern Univeristy (Ill.), becoming the first Mount Union wrestler to compete in the event and came home with a seventh place finish. As a team, Raiders were 17-3 overall and 6-0 in the OAC. 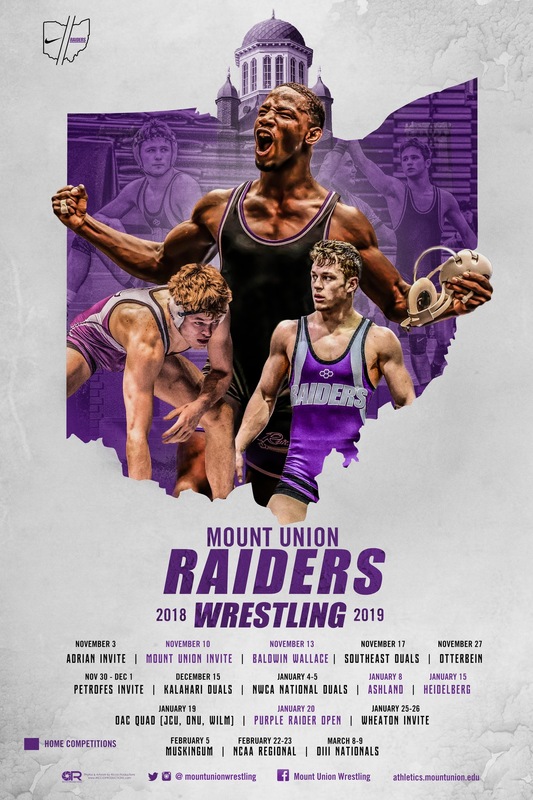 Mount Union is set to compete at the 2019 NCAA Division III Central Regional February 22-23 at Wabash College in Crawfordsville, Indiana.